Moving or dancing with awareness opens us to feelings which can be expressed in color, line or form. When we write immediately after the movement and art, a free flow of words emerges. While most traditional forms of coaching, counseling and therapy tend to rely solely on verbal exchange, expressive arts uses a wide range of self-expression methods to help you gain insight and awareness. The emphasis is on the process. The goal is not to create beautiful art, choreographed dance or publishable writing, but on self-awareness leading to positive action. The video below shows Dr. Natalie Rogers working with a client using the Person-Centered Expressive Arts approach. In a group or private session you might move physically to express an emotion that is difficult to articulate verbally, or use art to clarify a situation that is confusing. Appropriate guided visualization might be followed by journaling or drawing. You might be invited to act out a past or current situation or to focus on sensations in your body as a guide to your emotions. The expressive modalities are used in tandem with each other, and the results are often exponential. Person-Centered Expressive Arts is unique in that it combines the expressive arts process with the in-depth theory and practice of the person-centered approach of Dr. Carl Rogers. To practitioners of Person-Centered Expressive Arts, the first priority is the creation of a safe space in which you can be free to explore your feelings. In the words of Carl Rogers, “When a teacher, parent, therapist or other facilitating person permits the individual a complete freedom of symbolic expression, creativity is fostered. This permissiveness gives the individual complete freedom to think, to feel to be, whatever is most inward within himself.” Such an environment is the hallmark of the Person-Centered Expressive Arts process. The use of expressive arts in psychotherapy has evolved naturally as we come to understand the need to engage in activities that awaken and integrate all aspects of self—the body, mind, emotions and spirit. The expressive arts can help you rediscover your innate creativity and nourish your soul. It is an inner journey to creativity and self-acceptance. It can also be a sacred and often mystical experience. 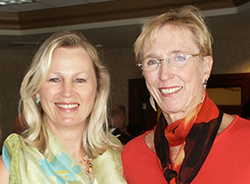 Today Dr. Sue Ann Herron carries on Natalie Rogers’ legacy and teachings through the Person-Centered Expressive Arts Institute as its Executive Director. She also serves as Executive Faculty and Administator for the PCEA Certificate Program which is offered in collaboration with Meridian University. Contact Dr. Herron about our training program. Person-Centered Expressive Arts is used with people of all ages across the globe. Practitioners can be therapists, social workers, educators, creativity coaches, consultants, pastoral counselors, and nurses. They are also professionals working in organizations, both for profit and nonprofit, which value creative engagement, greater communication, and non-traditional approaches to conflict resolution. Some of our graduates work with people individually in private sessions, while others facilitate groups, work in the community, or teach classes. A two-year PCEA training program is offered in collaboration with Meridian University. The next course begins in August 2019. Enrollment is now open. To learn more, please visit our Training Page. Our Executive Director, Dr. Sue Ann Herron, would be happy to set up a phone call or Skype session with you to discuss whether the program is right for you. Contact Dr. Herron. Download an application to the program. 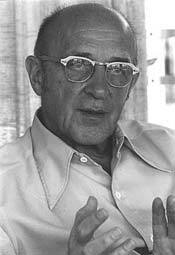 Carl Rogers (1902–1987) is one of the most influential psychologists in American history. His contributions are outstanding in the fields of education, counseling, psychotherapy, and conflict resolution and peace. As one of the founders of humanistic psychology, he has profoundly influenced the world through his empathic presence, his rigorous research, his authorship of sixteen books and more than 200 professional articles. Rogers developed the client-centered approach through his work in psychotherapy. First described in his book, Client-centered Therapy, published in 1951, his philosophy was later applied to many areas of human growth and development. As his ideas expanded beyond psychotherapy to education, parenting, medicine, social work, organizational development and other fields, Rogers used the term "person-centered approach." Rogers basic assumptions are that people are essentially trustworthy, that they have a vast potential for understanding themselves and resolving their own problems and are capable of self-direction if they are in a relationship that is empathic, supportive, caring and without judgment. He consistently emphasized the attitudes and personal characteristics of the authentic presence of the therapist as the prime determinant of the outcome of the therapeutic process. His belief in the client’s capacity for self-healing is in contrast with many theories that view the therapist’s techniques as the most powerful agents that lead to change.